With our diabetes-management-software-SiDiary you can easily import data from your Salter MiBody scale and use lots of advantages of statistical analysis; trend analysis and graphics to improve your therapy together with your doctor. This picture shows the data transfer from a Salter MiBody scale USB-Stick. 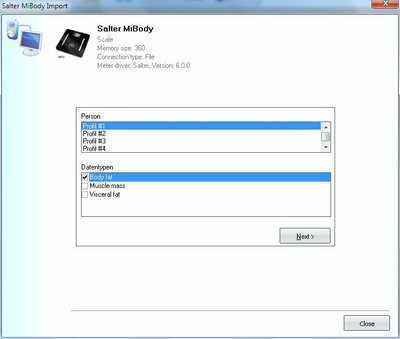 For the data import from Salter MiBody scale an USB Stick is necessary. You can use the original stick which comes with the scale or your SiDiary Stick as well.